BANGI, 8 Oct 2013- The Finance Ministry is to provide the required funds to enable public universities to carry out activities and programmes deemed necessary to ensure graduates they produce are more employable. Such programmes should be planned to nurture an ideal community in the campuses so that employers will come running to hire graduates they produce. Second Finance Minister Dato Seri Ahmad Husni Hanadzlah speaking to students of The National University of Malaysia (UKM) here today said to be highly sought after graduates they must have sincere intentions to develop not only themselves but to also help others. By having this desire they would have what it takes to be an indispensable asset to employers, community and themselves. He said success will come running after them if they have the intention to develop others without expecting anything in return. 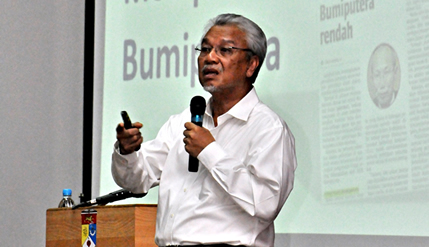 Ahmad Husni advised the students to do a lot of reading by not limiting only to academic books but also books on other subjects including philosophy and history. He said to be this kind of graduates they must have the right environment where students can naturally become graduates that are highly employable. It is not impossible for UKM to be the best University in the world, because others with less facility have done it. One example that he gave was graduates from Indian Institute of Technology. One out of four graduates of IIT works as a scientist or IT expert in the US. The marketability of the students are so good that they are hired by an advanced country, sometimes even before they graduate. He stressed that students should take advantage of the opportunity that UKM offers and developed so they can be good enough to make contributions to the country in such a way that it will take the country to the next level. Vice Chancellor Prof Tan Sri Dato’ Seri Dr Sharifah Hapsah Syed Hassan Shahabudin, Deputy Vice Chancellor (Students and Alumni Affairs) Prof Dato’ Ir. Dr Othman A Karim and College Principals attended the talk.